To say that Typhoons Ondoy and Pepeng are eye-openers is an understatement. Nevertheless, the two typhoons do underscore the fact that both government and the public need to be prepared for any disaster. As a former television reporter, I saw first hand the lack of preparedness of both the government and the public when it comes to these typhoons as well as other past calamities. I covered quite a number of typhoons. Most memorable for me were the landslides in Quezon province in 2004, and the mudslides in Bicol in 2006. Given these experiences, I’d like to share some tips on how to prepare for disasters and calamities. As these disasters would happen any time and would require journalists to drop everything to cover them right away, I saw the need to be prepared for these disasters. I realize that the measures I used as a reporter can very well help anyone prepare for calamities like typhoons, landslides, and even coup attempts. For now, I will focus on giving tips on protecting your belongings, as well as preparing supplies. Identify items that need to be protectedYou will not be able to bring everything with you should you need to evacuate your house. But you can protect items from being destroyed. One lesson we see from Ondoy and Pepeng is the advantage of having a second storey in the house. If you have one, then good. If you don’t, not to worry, you can still protect your items. Keep your documents protected with zip-lock bags. Use these as well to protect your cellphones, especially when you need to wade through the flood. Meet the Zip-lock bagWhat is key is for you to determine which items need to be most protected from flooding. It is key to put them on the second floor. These can include government documents such as insurance policies, land titles, birth certificates, diplomas. I would even add to these important memorabilia such as pictures. To prevent them from the elements, seal them zip-lock bags, which come in different sizes — and remember, these are sealable. They come at a higher price than ordinary plastic bags, but they are worth the investment.If you don’t wish to use zip-lock bags, you may with to try sealing your documents and albums in a plastic envelopes plus two layers of plastic. Remember, you will need some of these documents after a disaster. Photocopy Your DocumentsAside from storing documents in zip-lock bags, it is key also to have photocopies of vital documents. These can be stored in other locations in your house, should the original ones be destroyed. Digitize Your DocumentsYou can also digitize your documents and store them in your e-mails. You can also subscribe to free file hosting services where you can store as much as 100 gigabytes of files for free. Have extra supplies on the safest part of your houseWe’ve seen how Ondoy has stranded families on their second floors and roofs without food or clothing. If you have a second floor, then consider having vital items on the second floor like canned goods (don’t forget the canned opener), even extra clothing. You will save time and free yourself from panic if you know which items need to be put on higher ground when disaster strikes. Consider which ones get destroyed easiest. And which ones are the most important? If you do not have a second level, you may consider placing important items in two layers of garbage bags, sealed with tape. An essential tool that helped me is having an emergency bag of needed supplies. This allowed me to go to any coverage at any given time. Before I left the network, the bag was for typhoon coverages. Prior to that, the bag helped us prepare for any coup attempt. We reporters were encouraged to have what we called “coup d’etat bags”, which would be on standby in our vehicles. You have two options. One is to place the emergency bag in your house, on the second floor. If you live in a bungalow, choose an accessible place that will be flooded last. We don’t want our emergency bags getting destroyed. The other option is to place it in your car. To make sure that you have enough supplies for the entire family, it is ideal for each grown-up member of the family to have one. I recommend a backpack or hiking bag, which can contain all your emergency items. And of course, it’s easy to carry with you. Food/Canned goods: Go for the pre-cooked products like corned beef, sardines, sausages, and pork and beans. If your budget will allow it, chocolate bars and granola bars are an instant source of energy and nourishment. Make sure to have a week’s supply of food. Go for food items that are easy to open. Or at least, make sure that a can opener is also in the bag. First Aid Kit and Medicines: Essentials are medicines for fever, LBM, stomach ache, and allergies. If you have a preexisting condition like asthma, diabetes, or hypertension make sure that medicines for these are in the bag. Flashlights and batteries: Electricity almost always goes out. You may want to invest in flashlights that don’t require batteries, and only require hand power to produce friction, which in turn, powers on the flashlight. Emergency Clothes and Towels: You don’t need to buy new clothes. What I have done in the past is to put here my “Class B” clothes — clothes that are still in good condition, but are not worn anymore, or worn very often. You may also not have a luxury of washing your clothes, so I’d recommend buying disposable underwear. Toiletries: Like shampoo and soap, and sanitary pads for the ladies. I recommend buying several sachets so you can share them. Rubbing alcohol or wet tissue will also come in handy, especially when one is not able to take a bath. 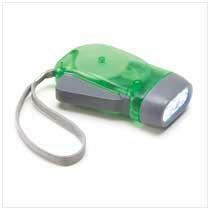 You won't need batteries for battery-free flashlights that use friction to power themselves. Cellphone chargers and batteries: You may wish to invest in an extra cellphone charger. You can also buy solar-powered or battery-operated chargers. Do invest on a second battery as well. It is key that cellphones are placed in two layers of zip-lock bags to prevent them from getting wet, especially if you need to wade in the flood. Invest in both the ordinary household charger as well as a car charger. Pillows: You may go for the inflatable pillows so they don’t take up space in your bag. 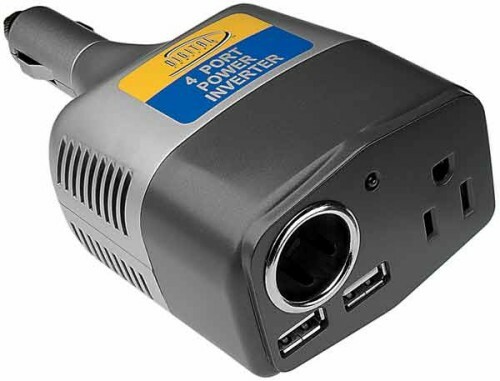 Power Inverter: This is a good investment. This is a device that allows you to plug appliances of up to 200 watts into your car lighter. Power inverters are reasonably-priced at CD-R King. During the typhoon in Bicol in 2006, this allowed me to charge my phone and laptop in our rented news vehicle even if the whole province did not have electricity. A Small Battery-Operated Radio: This will help you keep track of developments even without electricity. Cash: It is key to have different ATM accounts from other ATM Networks. The tendency during any crisis is for ATMs to go offline because of the demand from people. So if you have a Megalink ATM account, do open another account under Bancnet or Expressnet. Car: Make sure your vehicle always has fuel. Some gas stations may be closed during a crisis either because the station itself is flooded, or deliveries are delayed. House Drainage: Check the drainage of your house regularly. Make sure it is not clogged. Your cellphone: Your cellphone should have vital phone numbers — police stations, local rescue units, hospitals, and relatives. You may also consider saving your Philhealth, SSS, GSIS, Bank Account Numbers in your phone book. Remember, preparation is key. Preparation is half the battle. And we always remind everyone: Failing to prepare is preparing to fail. Keep safe, everyone. I trust that these tips will help you and your family. Do you have additional tips? Please post a comment below. This entry was posted in Commentary, Special Posts and tagged Calamity, Commentary, Ondoy, Pepeng, Special Posts, Typhoon by Ralph. Bookmark the permalink. What to do on Earthquakes? Next → Next post: Ask Ralph: How do you help a wrist-cutting friend?